When I was a kid, birthdays were a big deal. We always got to choose our favorite meal for dinner and then a favorite kind of cake and ice cream for dessert. I almost always picked rainbow sherbet, especially if there was raspberry in the mix. I still love birthdays - and that includes my own. I just celebrated my birthday two weeks ago and this year, my wonderful husband spoiled me by making sure I didn't have to cook or wash a single dish all day. 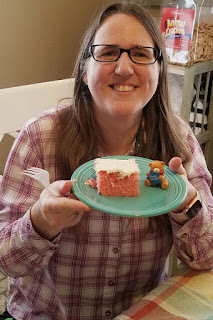 Plus, he cooked dinner himself, and he and our daughter worked together to make me a strawberry birthday cake with cream cheese frosting. Yum! Part of what makes birthdays as an adult so much fun is our birthday week tradition. A few years ago, my husband and I started to buy each other a number of small things and give one of those gifts each day through the week leading up to the person's birthday. It transforms a day into a week-long celebration and it's so much fun! From a new flashlight to a Thor figurine to the newest Legend of Zelda game for our Wii U, it was fun getting to open a gift each day and looking forward to seeing what he was going to surprise me with the next. Then, on my birthday, I got to open the last gift from him and the gifts our kids chose for me as well. Another birthday tradition is a cute little bear with the words "You're Special" written on a star he's holding. When I was a kid, my parents would take that bear and place it on the birthday boy or girl's plate. My brothers and I always looked forward to getting to have that bear for the day. After our son was born, my parents gave the bear to me. Our kids now get to have him sit on their plates for their birthdays. I absolutely love this tradition and, one day, will pass the bear along to one of our kids. This year, my husband got it out for me. And I have to say, it made the cake taste just a little bit sweeter. Do you have a special birthday memory? I'd love to hear about it! 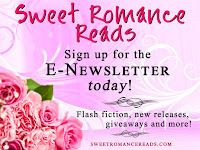 Melanie writes sweet, contemporary romance stories about faith, love, and family. Her latest release, FINDING JOY, is the fifth book in her Love's Compass series. She and her husband live in Texas with their two children who keep their lives full of adventure, and two dogs who add a dash of mischief to the family dynamics. In her spare time, Melanie enjoys photography, reading, crochet, baking, target shooting, leaning about essential oils, and hanging out with family and friends. A week-long birthday celebration sounds like so much fun. I love that bear. Thanks, Cindy! It is a lot of fun! That would be fun to continue the tradition with your husband now that the kids are gone! So fun, Melanie. And, a belated "Happy Birthday" to you! Happy birthday. I love your "bear" traditional. Thank you, Merrillee! The bear is a lot of fun. 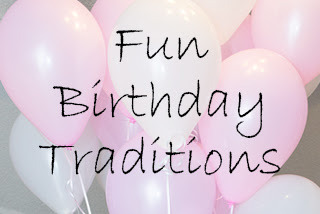 Love your birthday traditions, Melanie! I agree- birthdays should be celebrated for a week! Thanks, Shanna! It just makes it all the more fun! Happy Birthday!! I did the same thing growing up, picking my favorite dinner and cake. Now I just want books, lol.